This last weekend, I had my cousin and some friends over for a Christmas crafting night for the kids. I poked around a bit on Pinterest and came up with a couple crafts that we tried out. The first was a Christmas card made with washi tape. I saw THIS PIN and decided to do it with washi tape instead so I didn't have to cut tons of strips of paper. 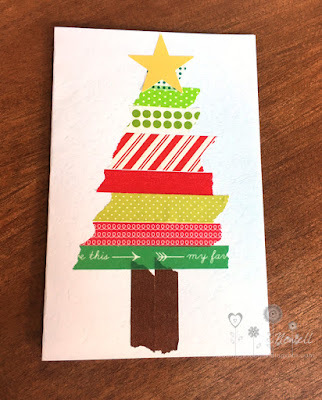 I pulled a bunch of red, green, and yellow washi and we used some brown washi for the tree trunk. I used a Stampin' Up punch to punch the stars out of yellow sticker paper from DCWV. That paper is AMAZING for working with kids! You don't have to put out any messy glue! It is textured card stock that's adhesive on the back and they just peel off the back like a sticker. 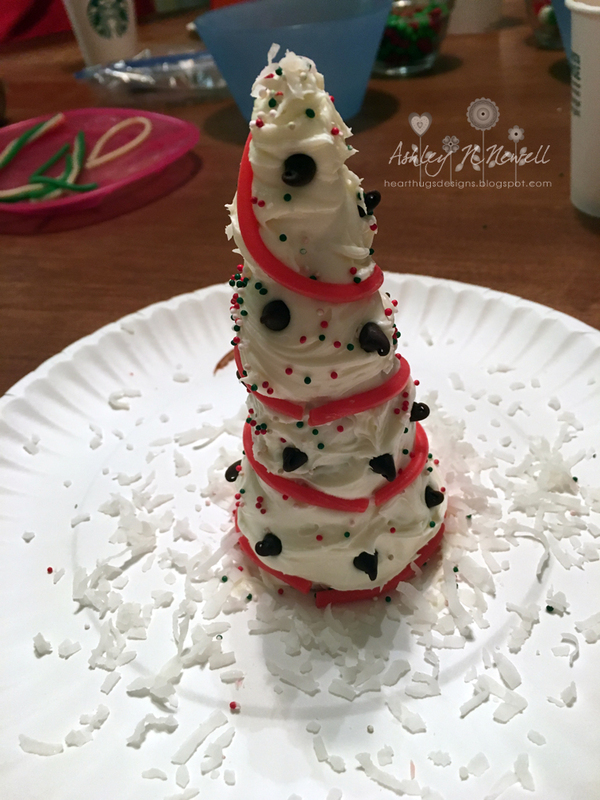 Next up, we did sugar cone Christmas trees. In a stroke of genius, I gave each kid their own little cup of frosting and plastic butter knife. Hooray for no mixing colors or sharing germs! I also asked each kid what color frosting they wanted and added some food coloring if they wanted. Avery ended up making a purple tree because she's currently obsessed with purple. This photo is actually the tree that I made. It looked like fun so I decided that I should make one too. I'm quite pleased with it. I think this craft night will become a tradition. I asked each family that came to bring a craft and a finger food. We also made beaded candy canes on pipe cleaners, pompom wreaths, and snowman soup. It was a fun night! What a fun idea! Love that the kids could help with the cards!